Book Review: 'The Border,' By Don Winslow Don Winslow's sprawling, operatic epic about the War on Drugs has some flaws, but it does the same thing Shakespeare's histories did: It simplifies current events into messy, bloody, gripping theater. 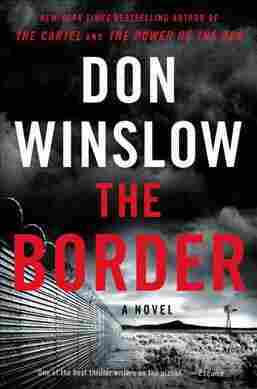 I have two things to say about The Border, the final book in Don Winslow's drug war trilogy. Both things are equally important. Both things are equally true. The first is that it's a very good book. The second is that it isn't. I'm going to start with the second thing first. The Border, like all of Winslow's books, is written in Winslow's voice, which is choppy, curt, atonal, ugly. It's the voice of someone who's trying to make fun of bad tough-guy pulp — stringing together the least amount of words into a sentence, the least amount of sentences into a paragraph. Worse, the voice of someone faking the affectation (which Winslow is not). And like all of Winslow's books, The Border is big. Doorstopper-big. It has a thousand characters, many of whom are dredged up from previous installments The Power of the Dog and The Cartel, and some of whom count as spoilers just by the mention of their names. The story doesn't so much bounce between POV characters as it grows through them like a chart showing the growth of a rampaging infection. The book is trope-heavy, stereotype-heavy, occasionally (okay, often) one-dimensional. It feels, for long stretches, like watching a fantastically good 80's action movie — one of those made in the days before self-awareness and irony became marketable. There is a lot of internal monologuing done by good men in bad places. The Border, like its predecessors, is a brutally grim book. There is no joy here. No looking away from the absolute horror of America's longest-running war — the war on drugs. So there's that. All of that to weigh against the counterargument, which is that The Border is a very good book precisely because of some of those reasons mentioned above. Because it is a huge, meticulously researched book that comes at the end of a series 20 years in the making. Because it is a book that eschews flowery language for precision and quick action. Because the internal monologues of quiet men are often the ways we are given to understand their internal histories. Because — and I am not saying this lightly — this is all basically Shakespeare. Not Shakespearean, mind you. But Shakespeare. As in, 300 years from now, when our children's children's children want to understand the defining conflict of the late 20th and early 21st century — when they want it presented with full lights and fireworks, costumed in gold chains and polo shirts, writ hugely in the way that only fiction can be — there's a fair chance that this is what they will read. Everything I know about 11th century Scottish politics I learned from Macbeth. Most of what I know about the Wars of the Roses comes from the Henrys and Richard III. These plays, they present a simplified, dramatized, bloody, glossy, terrible, wonderful, moving vision of a history that was very real and present to fans of Billy Shakespeare's epic soap operas in the 1600's. Don Winslow's trilogy does the exact same thing for the war on drugs. It is operatic. It is visceral. It has stakes that hang lives and nations in the balance. It begins, in The Power Of The Dog, in 1975, with DEA Agent Art Keller and a young Mexican man named Adán Barrera who will grow up to become the fictional head of the very real Sinaloa drug cartel. The trilogy tracks this relationship across decades, through war and prison, across continents. The Cartel ends in the jungles of Guatemala, in a huge battle which sees dozens of characters wiped out and Art Keller walking alone out of the smoke. A survivor whose war is finally done. That, of course, does not last. The Border begins amid that same smoke and destruction, with questions as to what happened to Barrera in the aftermath. Some people think he's dead. Others believe he is alive and in hiding; Adán Vive in graffiti, on roadside shrines all over Mexico. The shaky peace wrought by Barrera's victories — the Pax Sinaloa — is crumbling as a squalid mob of sons and cousins (called Los Hijos, all Ferraris and gold-plated automatics) begin scrambling to fill the power vacuum. And in the middle of all of this is Art Keller who, at this point in the trilogy, is essentially the world's most deadly AARP member. 300 years from now, when our children's children's children want to understand the defining conflict of the late 20th and early 21st century ... there's a fair chance that this is what they will read. Keller takes a job as the head of the DEA. Rises to become the leading general in the war that has been his life since 1975. And the story shifts from Mexico to the border, to New York and Washington D.C., tracking (as is one of Winslow's remarkable strengths) the totality of the drug war and the places where it touches politics, immigration, real estate, Wall Street and the opioid epidemic. Winslow's voice works best when he uses it to tell the story of a good cop playing at being a dirty one. He's at his most bitingly prescient — and unswervingly ruthless — when he brings a barely veiled Donald Trump stand-in (called John Dennison) onto the stage, or details the mechanics of getting drugs across the border in ways that no wall will ever stop. But taken all together, in its entirety — taken as a full, sweeping, fictionalized tale rooted and grounded in very real tragedy — The Border becomes a book for our times. Like Shakespeare, it makes a three-act drama of our modern moment. Like Shakespeare's plays, it shows us a world that is our own, a history that is our own, a burden that is our own, rendered out into the rhythm of scenes and arcs, chapters and parts. Like Shakespeare, Winslow leaves the stage covered in blood. Because, like Shakespeare, there's no other way these kinds of stories can end.